The system offers a spectacular low weight alternative to normal fenders. The fenders are up to 12 times lighter than traditional rubber fenders. Different dampening characteristics can be combined in one fender, each design is adapted to the vessel and its usage. The preferred way of fitting is bonding to the hull, since this is the fastest and easiest method. Besides some existing alternatives, we can also develop a custom mounting type that suits the application. The light weight material leads to signicant fuel cost reduction. Besides that, the fender will not absorb water, making it easy to do an emergency repair to prevent further damage and keep the effectiveness optimal. By adjusting the parameters of the different materials the fender has an improved contact area and is highly adaptable to the hull shape and intended vessel usage. The fender systems is suitable for ambient temperature between minus 30°C up to 55°C. Different temperature ranges on request. We also produce tailor-made fender systems for other applications such as superyacht tenders and windfarm support. 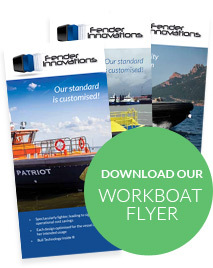 Are you looking for a new fender system or a refit for an existing workboat? Contact us for information!